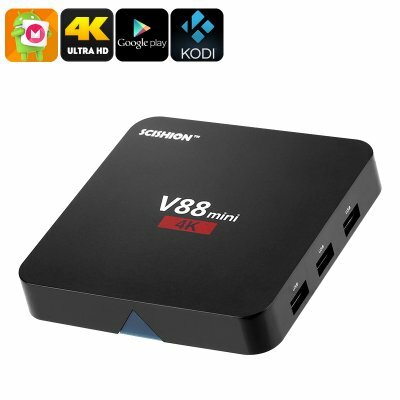 Successfully Added 4K TV Box Scishion V88 - Android 6.0, Google Play, Quad-Core CPU, 4K Support, Kodi TV 16.1 to your Shopping Cart. This Android TV Box is an affordable smart home appliance that allows you to use your regular HD TV as a state of the art smart TV. Use your 4K TV box to browse the web, watch movies, play games, and enjoy the latest Applications on your big screen TV – nothing seems to be impossible with this smart home gadget. Running on an Android 6.0 operating system, this mini TV box provides you with a smooth yet powerful user experience that treats you with the latest Android software features available. Whether you like to enjoy a relaxing movie night at home with your family or watch your favorite live sports game with your best friends – with this 4K TV box there’ll never be a single moment of boredom in your household again. Thanks to its 4K support, this Android 6.0 TV Box brings forth stunning visuals for those of you that own a 4K TV. Vivid color and extreme details – never before have you been able to enjoy your favorite types of media in such Ultra-HD resolution. The TV box packs a sophisticated 8GB of internal memory and supports 32GB external data storage for those of you that wish to insert extra media and entertainment. Coming with an IR remote control, you’ll be able to efficiently control your Android player from afar without ever needing to get up from your comfortable sofa. Within the body of this Android TV box, you’ll find the Rock Chip 3229 processor. This Quad-Core CPU has been clocked at 1.5GHz and brings along a lag free performance letting you enjoy the latest games, movies, and Apps without dropping a frame. This 4K TV box furthermore comes with the Mali 400MP graphics unit to treat you with high details and an intense graphical experience while enjoying your favorite type of entertainment. With access to Google Play and Kodi TV, you’ll always be able to download hour’s worth of fun onto your mini TV box for absolutely free. This 4K TV Box comes with a 12 months warranty, brought to you by the leader in electronic devices as well as wholesale electronic gadgets and TV Boxes..